Tucked away from the crowded piazzas of Venice, Campo Santa Maria Formosa is a charming little square in the Castello district. With a handful of cafés, a co-op market, and local shops, Campo Santa Maria Formosa offers a nice reprieve from the tourist hustle of Venice and allows a glimpse into local life. Named after the 15th-century church of the same name that borders the square, Campo Santa Maria Formosa is the perfect spot to enjoy a coffee and relax between tours or shopping. The square’s peaceful vibe lets you slow down a bit and enjoy the true spirit of Venice. You can tour Santa Maria Formosa Church, browse the local shops, or just relax and people watch. Campo Santa Maria Formosa is a true hidden gem in Venice. The delightful Castello town square offers a break from the hustle of Venice. Feel like a local as you enjoy a cup of coffee and rest before continuing your Venice explorations. Campo Santa Maria Formosa is located in the Castello district of Venice, a 5-minute walk northeast of St. Mark’s Square (Piazza San Marco). To reach Campo Santa Maria Formosa, take vaporetto water bus line 1 or 2 to the Rialto stop and then make the short walk from the Rialto Bridge (Ponte di Rialto). The streets of Venice are crawling with tourists during the popular summer months, so consider visiting between November and March to avoid the crowds. 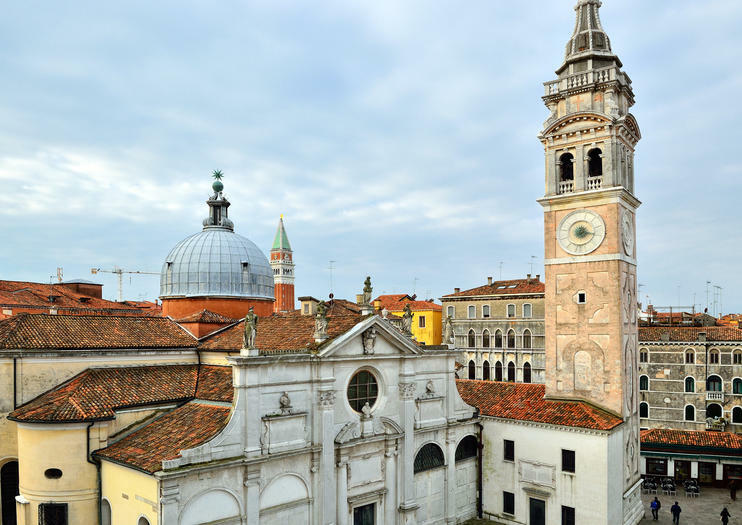 Head out early if visiting between April and October and seek out hidden sights like Campo Santa Maria Formosa for an authentic experience of Venice. Venice is divided into six districts or sestieri, each with its own distinct character. Castello is home to the Basilica of San Pietro di Castello and the Arsenale, the once mighty medieval shipyard complex that now hosts the Venice Biennale. Castello is the largest district, and in addition to major sights it has several relatively tourist-free pockets where you can experience the quieter side of Venice. On your visit to Venice this is a tour not to be missed! The secrets of the City of Bridges are uncovered as you learn about Venice through the eyes of a very knowledgeable English-speaking guide.Discover the city’s magical canals, cathedrals and hidden alleyways! Enjoy an unforgettable experience to visit Venice by night with a local guide, who will show you a spectacular scenery of the city wandering the quiet narrow streets, to explore its mysteries and legends .In the fading light of the evening , you will start your 3-hour tour from San Marco Square surrounded by the warmth of the lights, be captivated by the indoor visit of the majestic Doge's Palace,see the romantic Rialto Bridge and landmarks like Teatro La Fenice, Scuola Grande di San Marco, Marco Polo’s house .A stroll in the night , overwhelmed by the neighborhoods quiet and the sound of the Lagoon waves.Don't miss it! Explore Venice in a fun and family-friendly way on a private treasure hunt through the city’s most historic area, designed especially for families with kids age 11 and under. A search for clues around the city’s major landmarks keeps young travelers from getting bored, while adults get a break from the guidebooks as an entertaining guide leads the way. -Full day guided tour of Venice and Murano island on foot & by boat .-Enjoy the city with a professional local guide and art historian.-Discover the Art of Glass Making.-The possibility to discover the best of Venice, its art, culture, the living city and Murano glass island in one day.- A good overview of the city, today and in the past.- A customized tour adapt to your preference.On Sunday morning or religious feasts, due to the services in the basilica, the tour may follow a different order of the visit. Discover the mystery and enchantment of Venice at night on this 2-hour evening walking tour. Under the cover of night and the glow of streetlamps, stroll through quiet squares and winding backstreets as a guide recounts tales of terror, intrigue, and unusual events that shocked the city. See landmarks shrouded in urban legends like the Bovolo staircase, Teatro Le Fenice, and Marco Polo's former family home, and listen for the voices of the past along with the sound of lapping water from darkened canals. See the best of Venice with a 2.5-hour combined walking tour of some of the hidden parts of the city and a skip-the-line visit to St. Mark's Basilica. Enjoy seeing some of the hidden gems many visitors miss in the most popular parts of Venice from St. Mark's Square to the Rialto Bridge. Take in the gorgeous mosaics inside St. Mark's Basilica, including the rarely-seen Golden Pall. Get views of Venice's most important landmarks during this 2-hour morning walking tour. As the city and its scenic canals awake for the day, pass Venetian highlights like the Doge's Palace, St Mark's Square and Campo Santa Maria Formosa. Listen to your guide's commentary about these famous locations, as well as little-known facts about some of the city's hidden gems. Use of personal headsets to hear your guide clearly is included. With a backdrop as magnificent as Venice, you’ll want to share your visit on social media. This private portrait session will guarantee that you have plenty of shots worth posting on Instagram, or to share with friends and family. Pose with a professional photographer in iconic locations around Venice, including St. Mark’s Square, the Rialto Bridge, and the Riva degli Schiavoni gondola stand. Taste your way around beautiful Venice on this prosecco wine experience. Traveling with a sommelier guide means you won’t get lost, and you’ll learn about hidden secret spots that locals love. Your personal sommelier guide will teach you about wine, and you’ll enjoy two prosecco tastings in bacari (wine bars), as well as two local snacks. It’s a great way to get your bearings of the city, while tasting its delicious food and drink at the same time. A fascinating visit through the history of Venice to discover the less crowded part of the city and the old and still active crafts of the city with a venetian licensed qualified guide. The tour will enjoy adults and kids and will give you the opportunity to appreciate the city and the traditional handicraft activities of the past, like mask and glass making.The tour starts from san Marco square and take you through a labyrinth of narrow streets of Castello district, you will see a glass demonstration made by a Venetian glass master in Venice to see this magnificent art, you will visit a mask maker atelier and will learn the history of the Venetian Carnival and the use of the mask in Venice. The kids (and the adults) will enjoy the visit to the strangest bookseller of the world and to Castello district, the old area of sailors and shipbuilder, still today one of the more authentic area of Venice. Join us on a tour of the unique city of Venice; a wonderland of canals, cathedrals and hidden alleyways. With the services of a local English-speaking guide the City of Bridges will come alive. This is a truly memorable tour. A trip to the discovery of the Venice highlights, a guided outdoor walking tour through the canals, cathedrals and calli (the little alleyways of Venice). Your local guide will show you the secrets of this City of Bridges, one of the most beautiful and romantic city in the world, where to get lost, love and be seduced experiencing the thrill of the past and the charm of historical monuments like The Doge's Palace , San Marco Basilic and suggestive places like Rialto with its majestic Bridge and much more.A magical experience ! !The tour lasts 3 hours.Available in the morning or in the afternoon. Explore some of Venice's hidden treasures during this private 2-hour walking tour. See lesser-known sights like Campo Santa Maria Formosa, the Libreria Acqua Alta, and the circular Bovolo Staircase. This is a private 6-hour guided walking tour of Venice and includes a trip on one of the city’s iconic gondolas.The tour includes skip-the-line entry to St. Mark’s Basilica and the Doges Palace. You see many of Venice’s famous landmarks including the Rialto Bridge and what better way to end the tour than a leisurely trip along Venice’s canals on a gondola! Entrance fees are included.